Historically, debates about art and its cultural significance are thematically cloned by context. They often serve as mouthpieces for politics or trend. I believe that it is hard to create political art. Orwell was arguably the greatest political novelist not least because of his prescience. If you look at the art encouraged by totalitarian regimes you can see a clear illustration of the conflict. Those regimes do not want art. Hitler had no understanding of it, nor the hideously avuncular Joseph Stalin, both sought propaganda machines. The eternal narcissism of authoritarianism is challenged by the self-puncturing of real literature. During the 1960’s and 1970’s in the US a number of works were performed which transgressed the traditional boundaries of Western genre in the arts. Morrison’s “The Lizard” took nearly half an hour to perform in concert and is an act of descent. We’re into the underworld and back to the same divide. Aristotle based much of his philosophy around a basic opposition and Alfred Korzybski, the Polish semanticist argues in “Science and Sanity” that mental pathology within Western cultures stems from a basic confusion of signifier with signified, in other words thinking that a table is identified with the verbal label we attribute to it. He used to thump the table in his lectures and say “this is not a table.” He also saw the basic either/or basis for Western thinking as its primary flaw. Hegel moved it on in “Phenomenology of Sprit” where he sought a unity stemming from the synthesis resulting from the uniting of his thesis and antithesis, although his may be a variation on the Christian trinity. Alice Cooper enacted much of the Dionysian on stage, throwing live chickens into the audience, axing dolls to death. Why? Why didn’t they protest? Because they were caught up in group psychology. Why do leaders use it? It’s good for business. The Mediterranean wolf cults and the flute music of Dionysus, the wild music of the joujouka – the vestigial music of the God which had entranced Brian Jones, Bryan Gysin, William Burroughs, Paul Bowles and Ornette Coleman – had come to this, a preparation for a star. Into the darkness of Altamont, through the protective circle of the Angels on the blood-spattered stage, came the Stones, led by Mick Jagger in a black and orange cape and tall hat. They played well but their music spoke out the interface between savagery and erotics, between the controls of art and the controls of magic, between Apollo and Dionysus. Jagger began “Sympathy for the Devil” – “They call me Lucifer and I’m in need of some restraint.” The earlier Angels’ attacks now climaxed. In the spotlights, when Jagger went on singing this number, they stabbed to death a black youth from Berkeley named Meredith Hunter. Panic-stricken Jagger tried to cool the screaming people, but the death ritual operated as part of his own performance. The antithesis may be at the root of art and sexuality. Cultures create their own paradigms. I examine these themes in my novels. Wrong Crowd digs deep into it. A sultry novel in which an art thief finds himself out of his depth in a criminal maelstrom when he meets a beautiful woman with no past. When Claude meets Maxine in the Caribbean he falls for her. He does not expect he will start an affair with her back in London, then again he does not expect to have to call on the help of his old mate Spike, nor that will they become embroiled with Russian gangsters Vladimir and Grigory. But then Claude will do anything to hold onto Maxine. 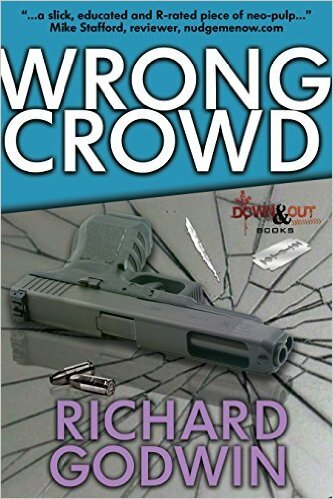 Peopled with thieves, hustlers, gangsters, gun runners and pimps, Wrong Crowd is a slick and action-packed ride into London’s low-life. East End villains and the Russian Mafia collide in a fast-paced novel of deceit and criminal obsession that sparkles as it speeds towards its astonishing conclusion. Richard Godwin is the author of critically acclaimed novels Apostle Rising , Mr. Glamour , One Lost Summer ,Noir City , Meaningful Conversations , Confessions Of A Hit Man , and Paranoia And The Destiny Programme . He is also a published poet and a produced playwright. His stories have been published in numerous paying magazines and over 34 anthologies, among them The Mammoth Book Of Best British Crime and The Mammoth Book Of Best British Mystery , alongside Lee Child, as well as the anthology of his stories, Piquant: Tales Of The Mustard Man. His novels have sold numerous foreign rights. Richard Godwin was born in London and obtained a BA and MA in English and American Literature from King’s College London, where he also lectured. Find Details and Sign Up Today!